Sam Sarowitz (owner of our favorite movie poster art gallery Posteritati) is releasing a new book called Translating Hollywood. The poster book takes a look at the different foreign movie posters for popular films. The book highlights examples of interesting (and somewhat surreal) foreign movie one-sheets from around the world, including samples from the United Kingdom, Japan, France, and of course the ubiquitous posters of Poland. What sets the book apart is the foreign posters are compared to the original domestic one-sheets to draw a contrast between cultures and marketing. Look no further than the comparison between the U.S. and the Polish poster for the Dustin Hoffman film Tootsie for an example of this. Our favorite poster from the book would have to be the Japanese Army of Darkness movie poster (which is yet another example of the King of the Mountain pose) which makes several changes to the original U.S. key art, including the addition of several Bruce Campbell soup cans. Author Sam Sarowitz will be having a Translating Hollywood book signing at his Posteritati gallery in New York City on May 7th. 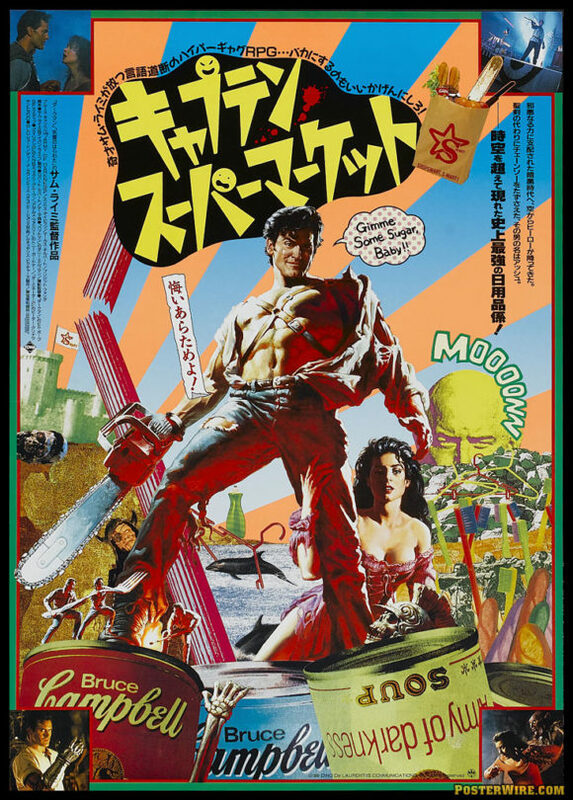 If only Army of Darkness was as good as its movie poster. Give me Evil Dead 2 any day.